The bench press is one lift that has been one big struggle bus for me in recent history. Not until I started working out with a crew of people and started actively troubleshooting my errors did I realize my [several] mistakes. One technical piece of the puzzle that has allowed my bench to skyrocket involves understanding the difference between “wrapping” the barbell and “breaking the bar.” While both of these items are external cues, I believe the input of one imagery guided cue has greater power than the other. Further, you’ll learn the principles behind what is being taught behind both of these external cues, which will be a key difference in improving how tight you can get and ultimately improve your efficiency in the this classic powerlifting movement. When looking to improve your overall numbers in the bench press, there are two easily understood ways to improve: get stronger, or become more efficient. Allow me to clarify. When looking to get stronger, you can use a multitude of ways to improve overall strength in order to build a more resilient and physiologically sound individual. For someone who grew up on a farm (or other likewise physically demanding lifestyle) and is used to the daily rigors of picking stuff up and putting them down hundreds of times throughout the day for months and years on end, the body can handle a lot. For someone who hasn’t done anything physically demanding, the category of “strength” is one area I’d love to improve from a general perspective. Now add physics into the equation, and you can add in a specific distance, and total weights used to make it a more complete formula. Keep in mind that when the body is stressed, the body will adapt accordingly (either good or bad). I make this distinction in order to differentiate between someone who is naturally strong, but has no knack for technique with respect to leverages, barbell placement, tension techniques, along with appropriate arching, this person will still have the ability to display great levels of strength in the traditional barbell movements. If you give someone without large amounts of “strength” technically sound coaching and guidance, you are improving their ability to be efficient with respect to bar path, grip, tensioning techniques, timing, and coordination. So if you are lumping yourself under the category of someone who isn’t naturally strong, I’d click the video below to understand what some cues others may give you in your quest for strength. At the same time, even if you are naturally strong, by applying these principles, you’ll be able to display your strength levels to the next degree, instead of flailing around, losing energy, and perhaps even losing integrity anywhere within your approach to the bench press. How does this make you more efficient? Well, I’m so glad you asked. Essentially after pursuing strength techniques and powerlifting more specifically, I’m more able to understand what it means to use this technique. Now have both hands at your side. If you are on your back, hopefully your legs/feet are on the ground. Now push into the ground with both hands, without moving your head or legs. If you are sitting down while reading this, sit tall. Place your hands on your knees. Push your hands down into your knees. Push down as if you are pushing your feet through the floor. Ideally, you would feel your abdominal area “kick on” to a great degree, maybe even shaking a little bit as you are holding this position. Well, this is a great PNF technique that involves understanding a specific motoric pattern – if you perform bilateral shoulder extension (what happens when you push down into the ground/knees), you will kick on thoracic flexion. How does this translate to powerlifting? Well, if you’re looking to do a bench press, you’re very likely to have some sort of an arch – essentially going into a gross extension pattern. 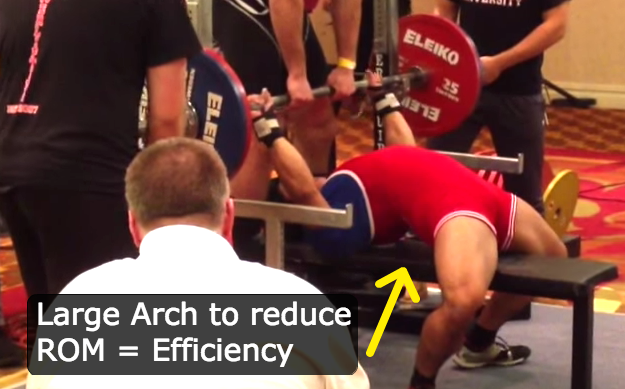 Side note: If you’re into powerlifting, efficiency is the name of the game. 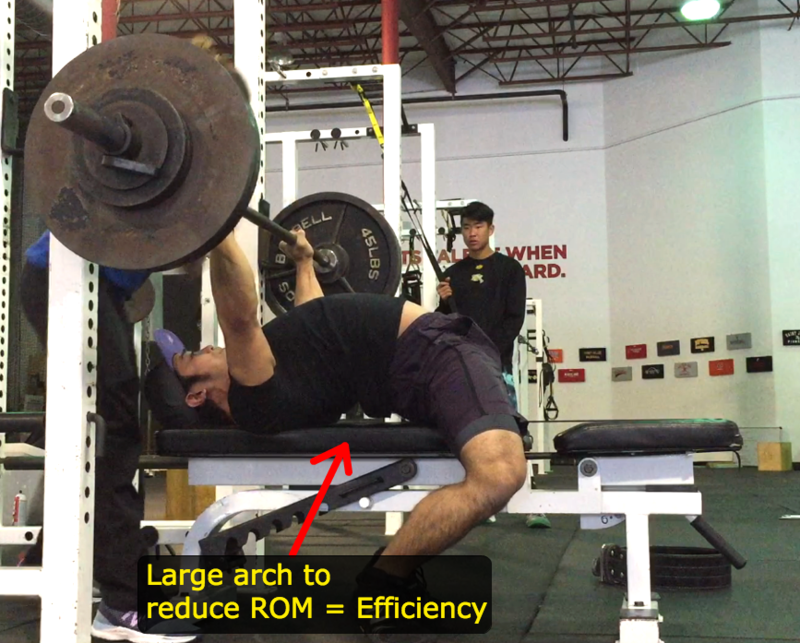 Dysfunctional or not, extension helps, especially with respect to arching in the bench press. In fact, it could be dysfunctional to bench press with a flat spine to the bench, as you are now increasing range of motion, which could lead to other issues up or down the chain from a sport specific point of view. 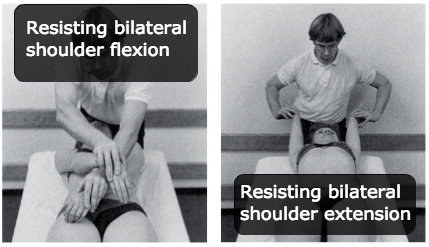 What happens if you perform shoulder extension (the act of “wrapping the barbell with both hands simultaneously”) on top of extending through your posterior chain/lumbar/thoracic spine? You’ll get a co-contraction – you are asking your body to hold a position in extension (kicking on your extensors) while simultaneously performing shoulder extension (which kicks on the flexion muscles in your body, and flexion motor pattern from your brain). Now, this is a great way to increase total body tension, and is likewise a great example in irradiation. Many of these “one weird tricks” are simply ways to improve strength from a neuromuscular pattern. I hope you find this one specifically helpful, and if you do, please share, like, and/or comment. This technique will help you feel tension throughout your whole body but it won’t add 100lbs to your bench press automatically (maybe it can take you from 0lbs to 100lbs, but not from 225 to 325lbs). Long story short, that process of improved strength takes time, physiological time for your bones, muscles, and hormones to allow for adaptation! But this can definitely improve your ability to feel certain things kick on that you didn’t know could kick on, along with perhaps a 10, 15, or even 20lbs personal record!